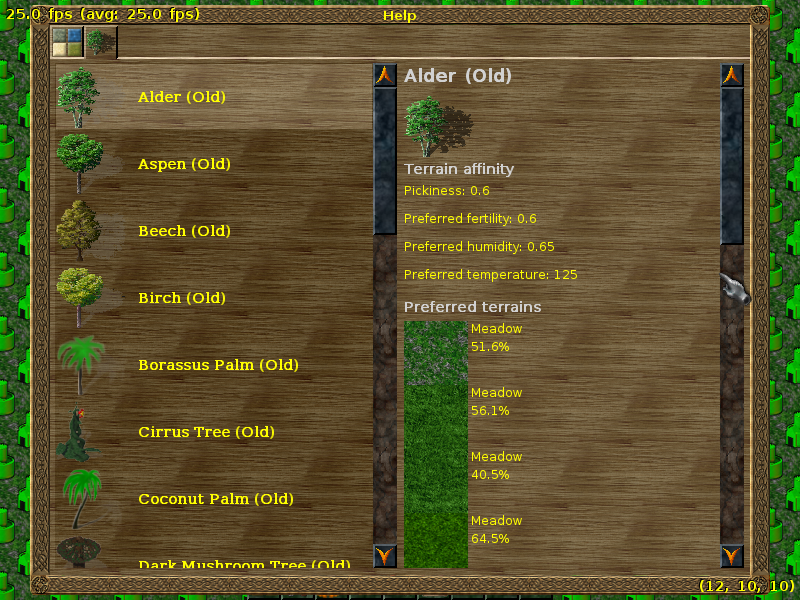 Since there is great demand to have some terrain/tree help, I have started to implement a help system for the editor. 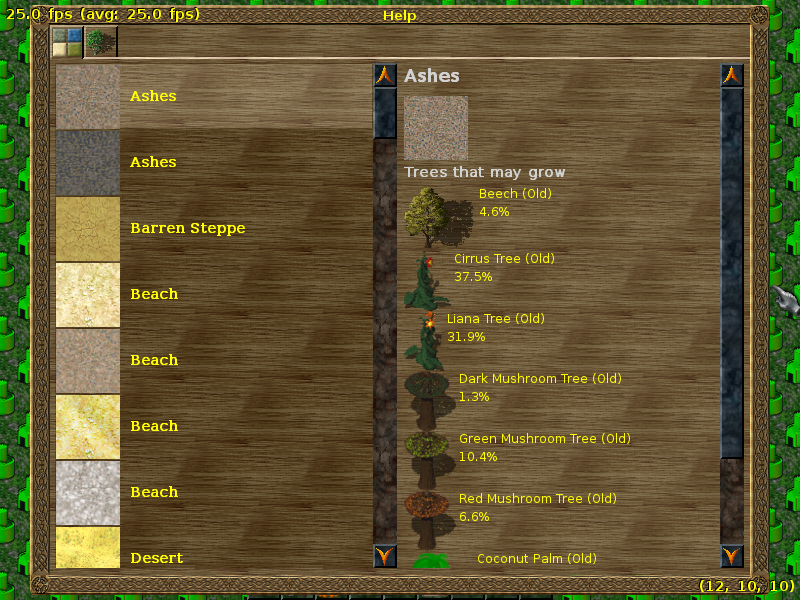 The most important information for trees and terrains is now available. A bit of prettying up? How do you produce percentages? And probably to terrains humidity/fertility/temperature should be added. how did you got the percentages? were they calculated using the equations? I will have to see how accurate my estimates were. We should also add resource info (default/allowed), but we can always do that in a separate branch if I don't get to it soon. Yes, I noticed - it's the exact same bug. The percentages are the chance that the tree will grow. They are the actual calculation results from the engine. My definition of "grow" is: A tree of the first state (sapling) exists. With the given probability, it will become "old" (and thus fellable) before it dies. Is this correct? Can we get rid of the "(Old)" part? It should be clear that we only care for fellable trees. We will need to change the descnames of the trees. Each tree is actually 4 different immovables, e.g. We would need to rename "Alder (Old)" to "Alder" etc. And then there can also be a falling tree which has no descname. Wouldn't it be easier to name the trees to "Alder" .. " " .. "%s" etc? This way, we would not have to translate 4 * number_of_trees, but only 4 + number_of_trees different strings. Or is this dependency needed for some languages? If we had the name of the tree (without attribute), it could easily be used. Renaming the immovable is bad because in the immovable menu, you still can see all of them. I think the current naming of trees is perfectly suitable and absolutely intuitive. It does not need to be changed. At most, in the help there ould be one single entry for the tree instead of a different entry for all stages of growth. But I don't think anything would be gained in removing the different names from the stages of growth. People can refer to them more easily if they have different names. A placeholder won't work if tree names have different gender. e.g. "Alte Eiche", "Alter Taxus" would be a possible translation into German.